Here are 6 Good Ways to know if You're septic system is on the way out. Where Can a Septic System Fail? A septic system is a series or group of components. The components have changed over time, but moder-day septic systems look like this. 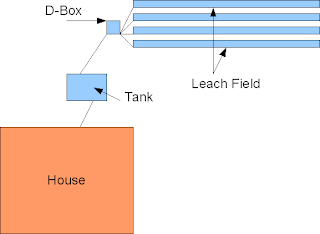 They have a large tank, a smaller tank (called a Distribution or D-box) and a leach field. Pipes connect each part of the system. The reason I'm showing you this diagram is a failure in just one of the components could produce some of the warning signs of system failure. But that doesn't mean your whole system has failed! I've seen many Title V inspections where the just the D-Box failed and needed to be replaced, or the Tank had cracked and needed to be replaced. It's not really a pass/fail on the whole system. Sometimes, the whole system does need to be scrapped, but you should always make sure you're talking to a knowledgeable professional. With that, we'll start with 6 things that may tell you your septic system is Failing. If you have a state licensed professional out to inspect your system, and he tells you it's failing, well, that's a bad sign for your system for sure. An obvious one, but I need to get to 6 here. What Does Title 5/Title V in Hand Mean? How do I Buy a Home with a Failed Title V? HASN'T BEEN RAINING, that's a sign of failure. 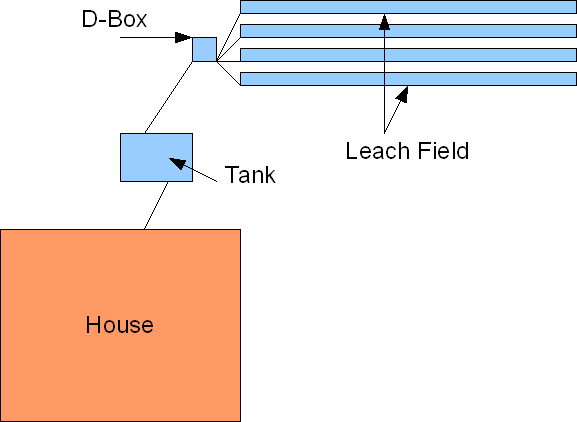 Your leach-field is designed to absorb all the household water you produce, and distribute it into the soil -without saturating or flooding it. Once your leach-field loses its distribution power, the system can't function well, and you'll have ponding. In a similar way, if the water is unable to drain quickly from the tank, than the back up will occur near the tank. This could indicate a blockage or failure in one or several components, but is a clear sign of trouble. There's another word for human waste - Fertilizer! Although we don't think about it much, the waste we produce has a purpose in the ecosystem, and that results as having a fertilizing affect on our lawns. If your leach field or tank have grass that is noticeably greener and healthier than the rest of your lawn, your system could be overflowing, and delivering waste into the ground in ways it wasn't designed to. Ah, the smell of septic in the morning! It'll wake you up, that's for sure. It's not pleasant, and if you're smelling it in your home, it's a good bet something is clogged and not draining properly. It could be a small problem, or a big problem, but it's not a "take care of it later" problem. Get an expert and find the cause. Septic gases are not only smelly, they can be dangerous. Again, pretty obvious here. If it's not even getting to the tank, you could have some serious issues!